Container gardening has become a hot topic in recent years as more of us are living in condos and apartments and would like to garden. Also, as we age, gardening with containers allows us to garden with less bending and kneeling. To be a successful container gardener, you need to know not only about the plants that grow in containers but also how growing in containers affects plants. 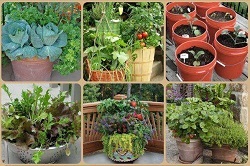 A Certified Master Gardener Volunteer from Dane County UW-Extension will talk about the advantages and disadvantages of different container types, container soils and their characteristics, watering and fertilizing schedules, plants that are well-suited for containers, and container design.